During my days as a professional organizer, I worked side-by-side with clients in their homes and offices teaching them a 5-step process for organizing their space. I also taught this process in a group setting via local workshops and presentations. It’s high time I shared it with all of you, don’t you think? Start your project by determining the “mission” of the space/room. Don’t skip this step. You need to determine specifically how you want this space to serve you so you’ll know what things ultimately belong in that space. What functions will this space serve? Is it a multi-purpose space? For example, most of us use our kitchen for meal preparation, food storage, and eating family meals. 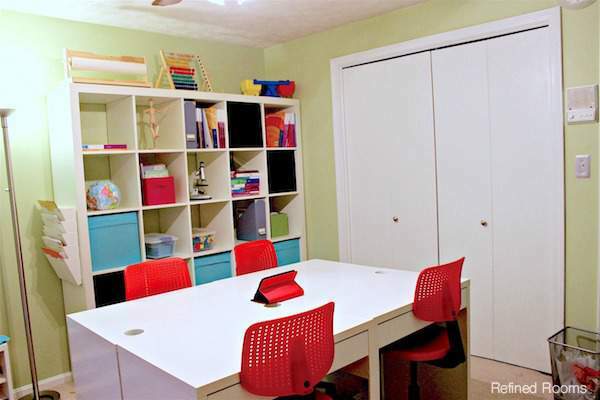 Perhaps you also use your kitchen table as a homework station/craft area for your young kids. If so, then it makes sense for craft supplies to be stored in the kitchen. In my home, our guest room is a multipurpose space. 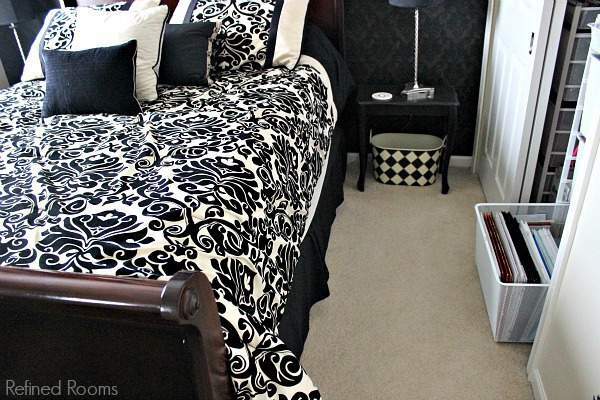 Not only is it used as a bedroom, we also use it to store print photos/scrapbook albums, and gift wrap supplies. So when I come across items that don’t fit into the category of Gift Wrap Supplies, Photos, or Houseguest Items, they need to be moved out of the space during the Purge step. Step 1 is all about evaluating the space you are organizing. In step 2, you continue to wear your “evaluation hat”, but now you will be evaluating each item that’s currently in the space. Word of warning: this is where things get messy, so mentally prepare yourself for things to get worse before they get better! As you begin the sorting process, it’s helpful to have some specific tools on hand to make the process go more smoothly. 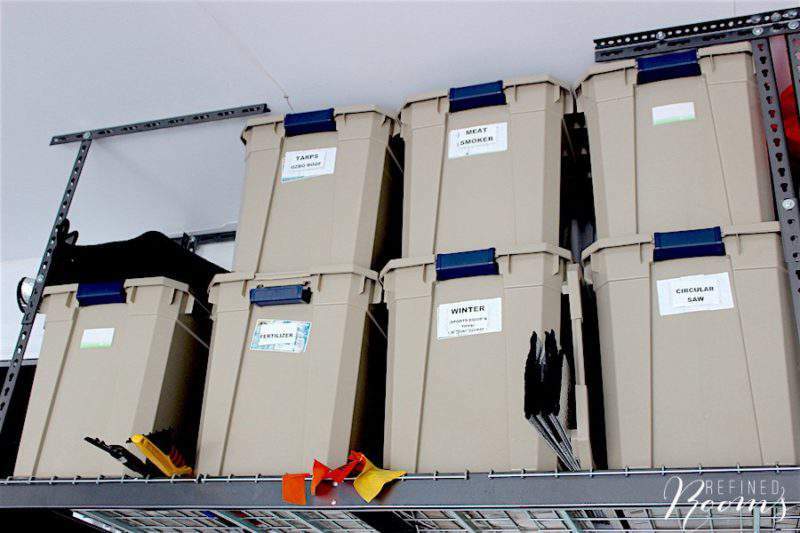 You’ll need trash bags, sorting containers and some sort of signage to identify sorting categories. 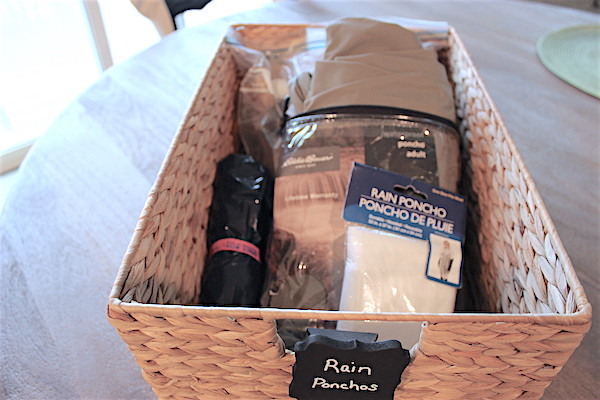 I recommend creating a decluttering kit to have on hand for your organizing projects. 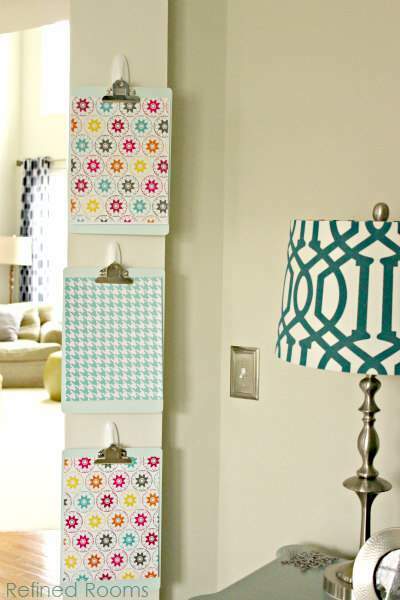 You’ll need a large flat surface to sort your items. You can use a bed, large table, or kitchen island. If your space is extremely cluttered, set up a sorting area in a nearby room. Begin the sorting process by taking everything out. This gives you an opportunity to take a good hard look at the space to determine how you might improve upon it. 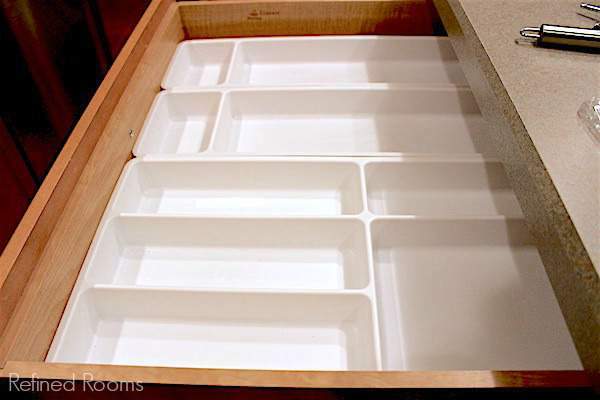 I recently gave this kitchen utensil drawer an overhaul, which included getting rid of the existing utensil organizer (that wasn’t ideally suited for the drawer) and replacing it with drawer dividers that worked so much better for the space. Totally clearing the space also ensures that you evaluate every single item. Now it’s time to go item by item and sort into categories. I like to start with an initial “rough sort”, which involves deciding whether an item belongs in the Purge pile (anything that you can immediately let go of without even thinking about it), or the Relocate pile (you’re keeping it, but it doesn’t jive with the mission of the space and must live somewhere else). If it doesn’t meet either of these criteria, then sort the item into a logical category. 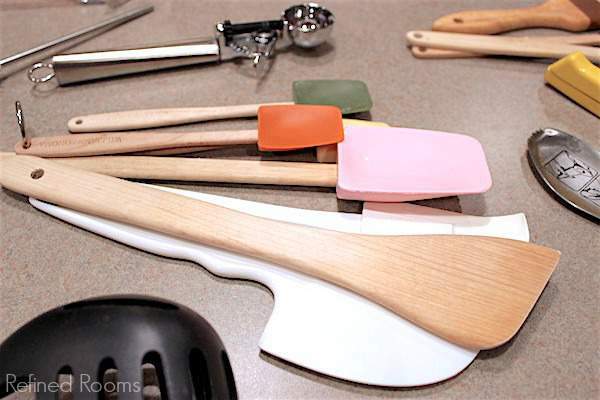 For example, when I sorted through items in my utensil drawer, I had mixing bowl scraper, spatula, and kitchen thermometer categories. Once you have everything sorted into categories, it becomes clear where you have excess. O.K., ready for the tough part? If you’re like most people, this step is the hardest. It’s time to make the hard decisions as to whether each item deserves to occupy precious space in your home. In my case, I had to determine if I truly needed those 7 scrapers. Since I don’t bake very often, I decided that keeping 3 was sufficient. So I picked the 3 that I like the best, bid adieu to the remaining 4 and tossed them in my Donate pile. Is this broken, worn out or past it’s prime in any way? What’s the worst thing that can happen if I got rid of this? Does keeping this align with my goal to simplify and streamline this space? Once you’ve made the decision to let go of an item, you’ll need to decide how it will leave your life. There are countless places that accept household donations. I’m a huge fan of donation centers that will come to your home to pick up your items. 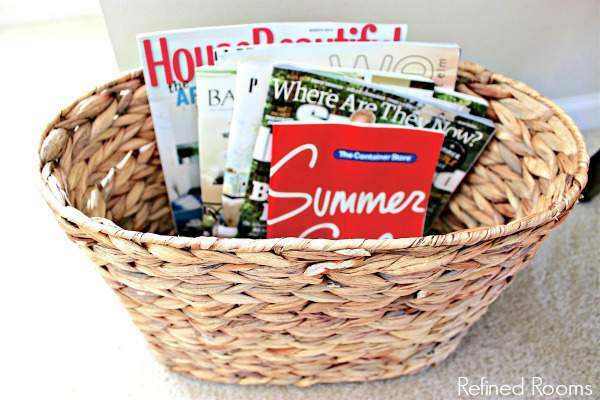 Schedule a donation pick up as soon as possible after you complete the Purge step (or load those donations immediately in the car for drop off) to prevent the donation pile from becoming a permanent fixture in your home. Don’t forget to take advantage of the tax deduction that comes with donating household goods. Of course, you can also donate items by giving them away to friends and family members. Just be sure to give yourself a firm deadline for delivering these items to their new home AND be sure that the intended recipient actually wants your items (many times they don’t). Selling items in your Purge pile can make sense if you have the potential to recoup a significant chunk of change, given the time and energy required is worth it to you. Good options for selling include: Ebay, Craigslist, consignment stores (local and online like Swap.com), and garage sales (as a last resort). So many things that were once considered trash can now be recycled. Explore the recycling resources available in your community by checking out your local waste management website (mine offers a Recycling & Reuse Guide that’s serves as a fabulous resource for figuring out where I can recycle just about anything). You can also check out Earth911.com to find recycling options in your community. As much as we all want to avoid contributing to the landfill, sometimes there’s no avoiding it. When you come across items that are rusty, bug-infested, broken or rotten, it’s simply time to trash it. A word of caution about this step…be sure that you aren’t inadvertently creating obstacles for yourself by falling prey to the idea that you can only get rid of an item if it goes to the absolute perfect home. I’ve witnessed several clients getting stuck in the purge process because “this sewing machine has to go to my sister”, or “I need to ship these dishes to my cousin”. Slowly, the purge pile from one space becomes clutter that lingers in the garage or basement as these items await delivery to their final destination. Do yourself a favor and just call Salvation Army for a pick up. Really. Finally…the fun part! In the Organize step, you get to assign each item a home and put systems in place for storing and retrieving your items. Raise your hand if you’ve started an organizing project by going out and purchasing a bunch or pretty organizing products without a plan. 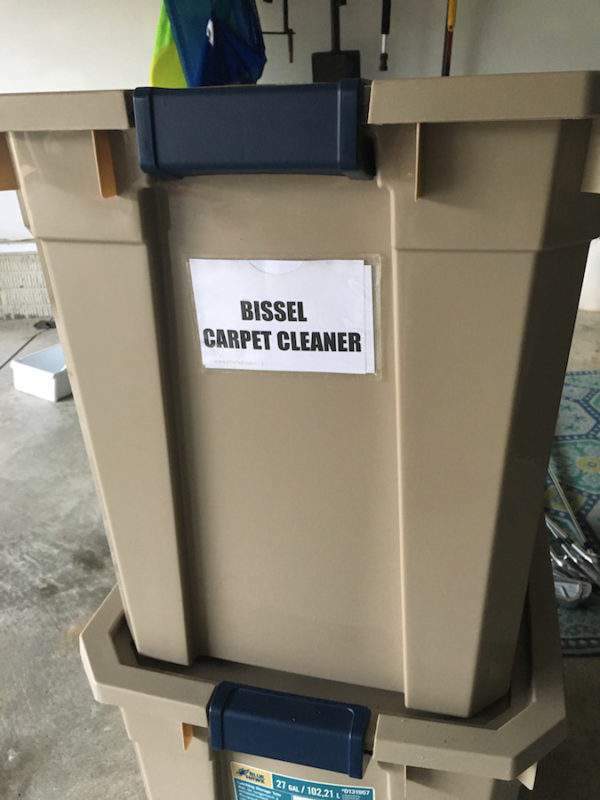 It’s so easy to be seduced by all of those pretty bins, BUT if you start with this step, you’ve failed to get rid of the clutter first. So you’ll end up organizing a bunch of things you don’t use or want anymore. And that’s just silly, right? When you complete this 5-step process, you let go of the things you don’t need, sort what you plan on keeping, THEN store those items in a way that works for you and your space. At this point in the process, as yourself, “what tools can I use to best organize the categories of items I plan to store in this space?” You’ll need to consider how many items you have in a category, as well as the constraints of your space. Yey! You finally get to go container shopping! (or simply “shop your house” for items that you already have on hand). 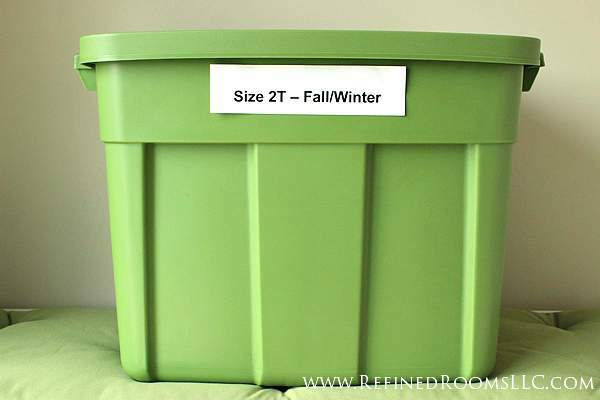 Use products and containers to subdivide larger spaces (such as a closet or drawer) into smaller spaces. Another often overlooked storage opportunity is your ceiling. Using ceiling-mounted storage shelves in the garage or an over-the-island pot rack in your kitchen are shining examples of this. I’ve also been known to tuck seldom-used items in the rafters of my basement storage area. 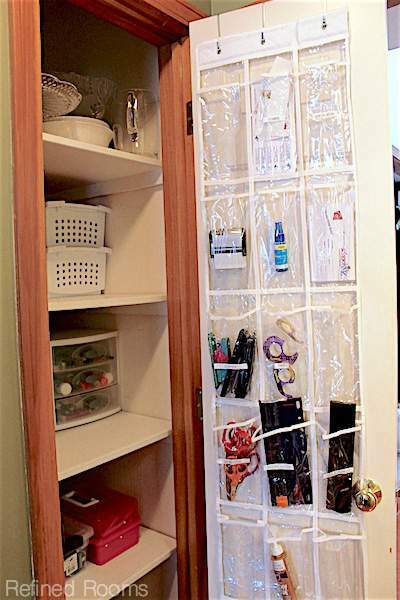 Longtime blog readers are aware of my love for “back of the door” storage. 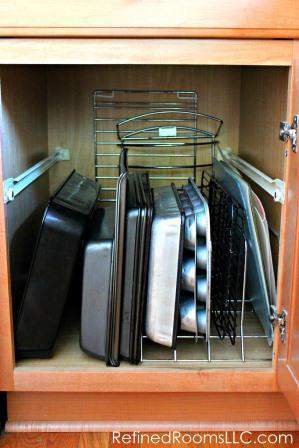 It’s often an untapped gold mine for beefing up storage space in your home. We all have them. I’m talking about those dark abyss spaces in your home where items go in, never to be found again. If you have a deep corner cabinet or a really deep pantry shelves, you know what I’m talkin’ about. Fortunately, there are several solutions for this organizing challenge. Installing large lazy susan turntables enables you to bring the contents in the back of the cabinet to the front with a simple spin. 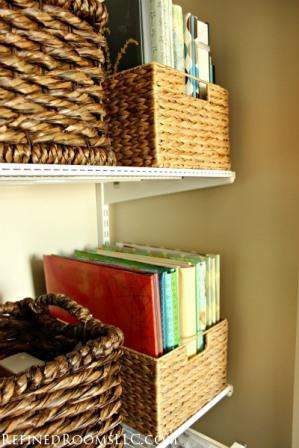 Using storage baskets for housing smaller items makes it much easier to access the contents of your deep cabinets. 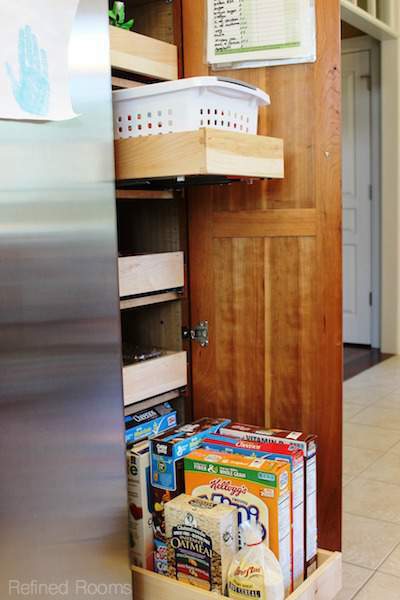 Installing glide-out drawers can also do wonders for increasing accessibility to what’s stored in the back of the cabinet. So everyone knows how much professional organizers love labeling things, right? Not only are labels pretty, they make returning items to their proper home a no-brainer. Quite a few organizers have made the comparison between organizing and weight loss, and with good reason. Just like “losing weight”, the goal of “getting organized” is a process that requires a lifestyle change (as opposed to an event). Both require ongoing effort to maintain your success. Maintenance is the final (and most important) step in any organizing project. Getting organized without the maintenance phase is like yo-yo dieting. You might find it helpful to create the following house rule: every time a new item comes into the home, a similar item must leave. This rule really does help to reduce clutter build-up over time as you get into a rhythm of continuous purging. It also makes you think twice when making a purchase. 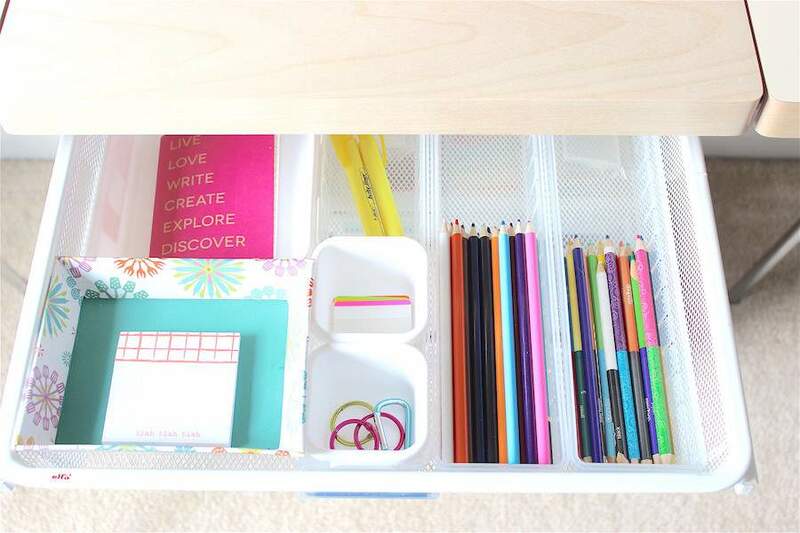 Maintaining an organized space will require you to develop some new habits. Anchoring a new habit onto an already established one can make it so much easier to stick with the new habit. For example, if you want to maintain an organized refrigerator, you might decide to schedule a fridge clean out session to coincide with your weekly trash day. 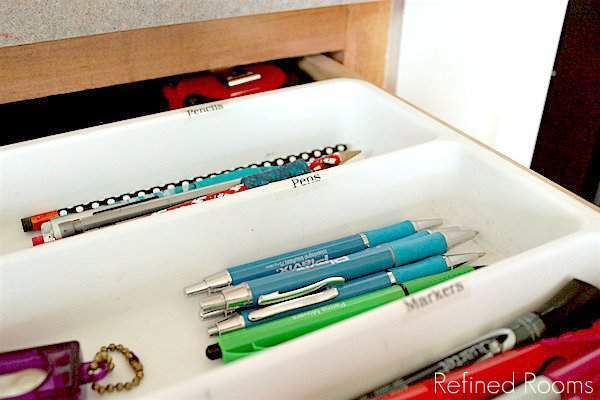 Look for ways to simplify your organizing systems to make it as easy as possible to maintain. 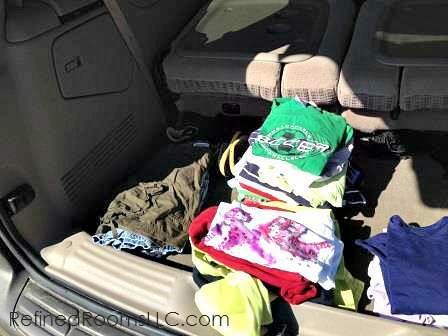 Are you always finding dirty clothes on the bedroom floor in your kid’s room? Remove the lid from the hamper. Do your family members avoid hanging coats in the coat closet? 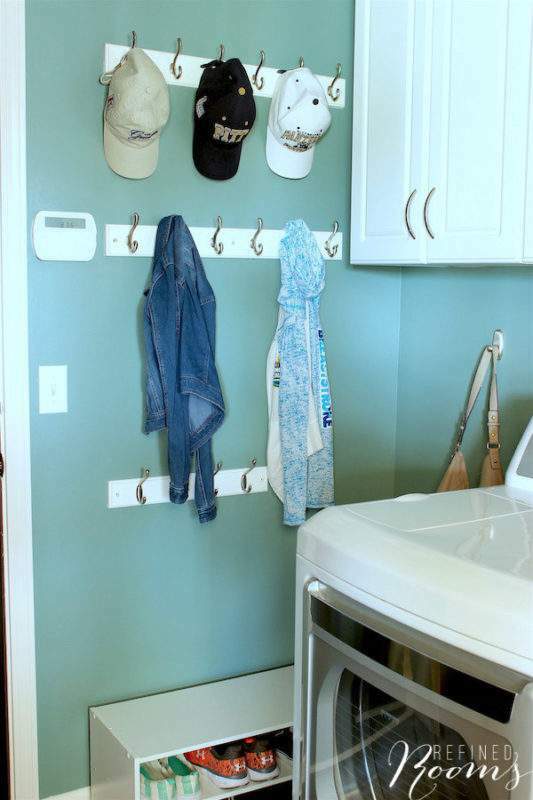 Install hooks near the door. So that’s the process in a nutshell! It’s easy to get overwhelmed when faced with the task of organizing a chaotic space in your home. But if you approach the project by going through these 5 steps (in order), you can tackle even the most disorganized of rooms! 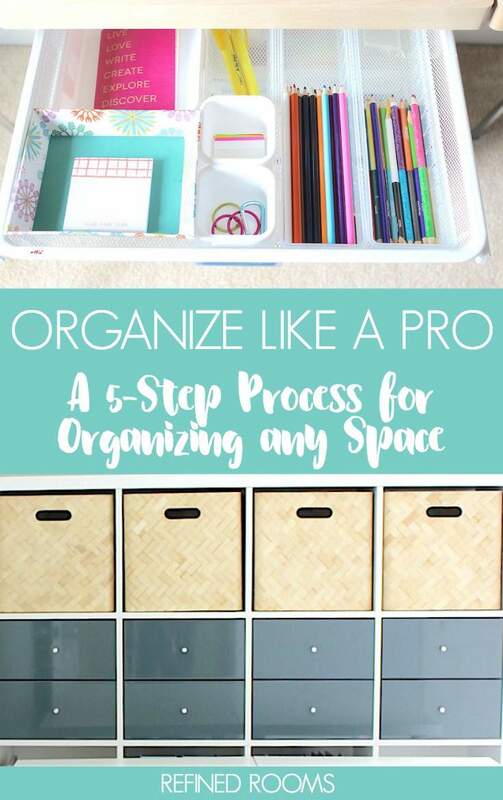 I’ve put together a 5-Step Organizing Process printable for you to use as a quick reference when it comes time to tackle your next home organization project. Print out a copy, go attack a space in your home, and be sure to come back to report on your success! Want MORE tips on the decluttering and organizing process? Click here to access an entire gallery of posts! I love your tips about how to organize one’s space. My favorite step is taking everything out, putting new organizers, and sorting them all out. I believe these tips fit the office setting as well, and it reminded me of my mother’s sewing room where she stores all her designs in stacks. 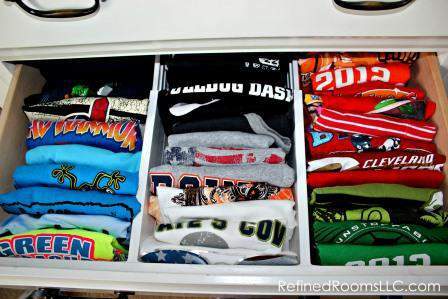 I will help her by getting her a storage drawer while keeping these tips in mind. So glad you found the tips useful Yoshiko! Evaluate and purge are obstacles for me. I can’t seem to get rid of anything these days especially if it cost a few dollars. Getting overwhelmed, so I’ll need to do something soon. Thanks for sharing these great tips with us at Funtastic Friday. Your situation is all too common Sherry! Purging prompts can be really useful to help you through those tough decisions. You might want to grab my Declutter Tool Kit, which has a Purging Prompts handout to use during the sort and purge process..thanks for hosting Funtastic Friday! These are fantastic (and all-encompassing) tips! I love that you include maintenance with your tips. That is such a crucial part of any great organization plan. Thanks for sharing your tips with us at Merry Monday this week! Oh Julie, I couldn’t agree with you more! I’ve seen it happen time and time again (both with myself and formerly with my clients). Thanks for visiting!